The Praça da Matriz, downtown Porto Alegre, scenario of the Legality Campaign, staged another act this Tuesday, which, just like the one led by Leonel Brizola in 1961, will become part of Brazilian history. 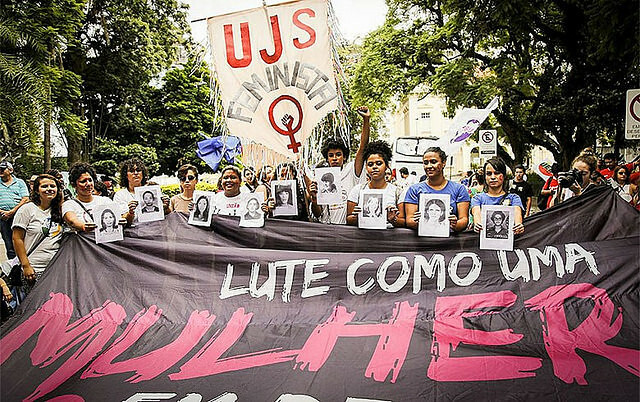 Similar to the fight for João Goulart's taking office, led by the governor, this demonstration for former president Luiz Inácio Lula da Silva's right to run for the next presidential elections was commanded by thousands of women defending the respect towards the law and a fair trial, without political biases. The act, initially scheduled to take place in the auditorium of the Legislative Lower House of Rio Grande do Sul, gathered politicians from different states as well as Brazilian and foreign citizens in the capital. "My roots are the land, I'm from a peasant land. Today I'm here because this fight belongs to all of us, to defend democracy. Lula deserves this fight, he represents us. Since the coup, we have felt many differences, the countrymen do not have any support, financing, which has all been going to agrobusiness. The Temer administration has extinguished family farming," stated Irdes Guadagnin, 59, retired rural worker and popular educator. "I'm in Brazil in defense of democracy and have traveled over a thousand kilometers to be here. We understand that what happens in Brazil and in Argentina can reflect on Uruguay, where they want to take our improvements away from us," said the Uruguayan union leader Raúl Ferrando. The truck parked in front of the Assembly hosted members of parliament, such as the federal deputy Maria do Rosário (PT-RS), Alice Portugal (PCdoB-BA), and Benedita da Silva (PT-RJ), the state deputy Manuela d'Ávila (PCdoB-RS) and the senators Lídice da Mara (PSB-BA), Fátima Bezerra (PT-RN), Gleisi Hoffmann (PT-PR, national leader of the party), among other politicians. Student unions and youth groups marked a strong presence. "The people finds themselves in the streets supporting Lula's right to be candidate. Convicting him will mean to convict the country and its workers as well. We have a change in this country during his government, with more inclusion. Now, with frozen investments and hideous reforms, the people has gathered in defense of democracy," said Benedita da Silva. "Without crime, they took down the first woman to become president. Now they want to take down a Northeastern migrant who does not speak English or French, but who speaks the language of the people," shouted Alice Portugal. Pre-candidate for president, Manuela d'Ávila emphasized what it is not the judiciary's role to engage in the political game. "What we have been witnessing is the unfolding of the coup. The only political trial is the ballots and this is what we want to see Lula being submitted to. "Looking at the crowd occupying the square she read a poem by the Brazilian author Thiago de Mello. The demonstration, which took place in the lead up to the Lula's appeal hearing at the Federal Regional Court of Appeals (TRF4), was wrapped up by former president Dilma Rousseff's speech, who classified the ongoing coup as an act that humiliated the country. "They kneeled Brazil, subjugated not to its own interests, but to the interests of Northern countries,"she said. For her, the coup aimed at destroying the Workers' Party and Lula, but "went wrong". She then quoted the opinion polls placing the former head-of-state as the favorite candidate for the 2018 elections. "The coup failed politically, none of their leaderships resists popular scrutiny. The only one left standing, Alckmin, does not have enough support. And their creation, Doria, was turned into something of real dimensions, that is, from a political standpoint, into nothing." Dilma reminded the public that that square had once had a decisive role in Brazil's destiny during the Legality Campaign, situation that is happening again, 57 years later. "We are in a democratic resistance. Beforehand it was the dictatorship, now it is the resistance against the parliamentary coup." In the same way she has done in other public appearances, the former president reinforced that her impeachment was the coup's first act, followed by a second one, expressed in the reforms and new laws approved during Temer's administration, which would "never" have had popular support. Now we are looking at the third act, which is trying to stop Lula from being a presidential candidate. Dilma stated that Lula's lawsuit has "absurds", recognized by national and international judges and that it is, in fact, a process of political persecution. "With your support, Lula will have chances to wash this country's soul."